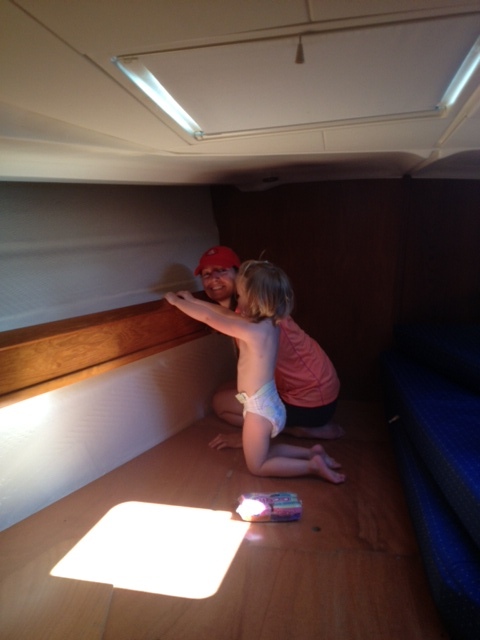 In terms of the boat, we as a family continue to learn how to live together and function as a unit in a very small space. We are four weeks into this journey and continue to enjoy it each day. Our total living area is less than 350 square feet. Within that, it has been a true joy and the memories that we have created already in such a short time will last a lifetime. 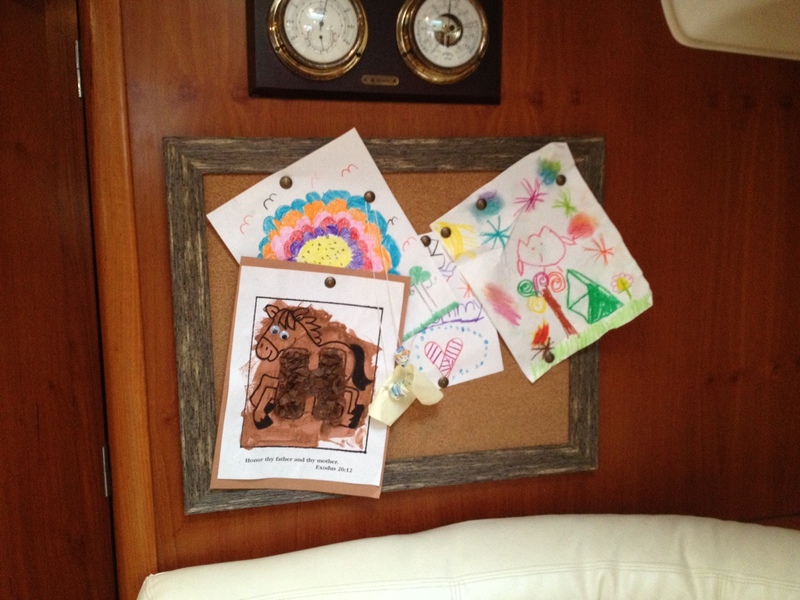 The boat is starting to feel like home with the addition of some art from the McAllisters (truly appreciate the thoughtful gifts), cork boards for the kids’ art, and an updated room in the forward stateroom (more on this DIY project below). The kids came up with a saying that sums it up well, “Everything’s better on a boat.” Maria’s version of this is “Yaaaaaaaah Boat.” It truly melts my heart when she says this and she is fond of saying it often. As far as “the list” of projects that we want to accomplish before we head out, we are two steps forward and one step back. 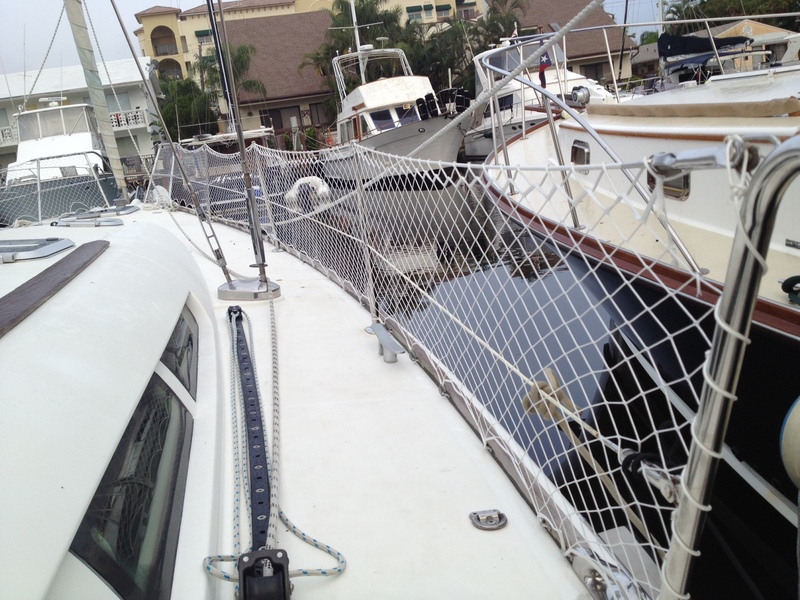 On the forward side, the netting around the boat is complete. This netting is just one more safety precaution that we are taking. Also on the forward side is the anchor replacement which is another safety precaution. The boat had two anchors on it but we wanted to upgrade the anchor for better holding as well as having an all chain rode vs part chain and part line. 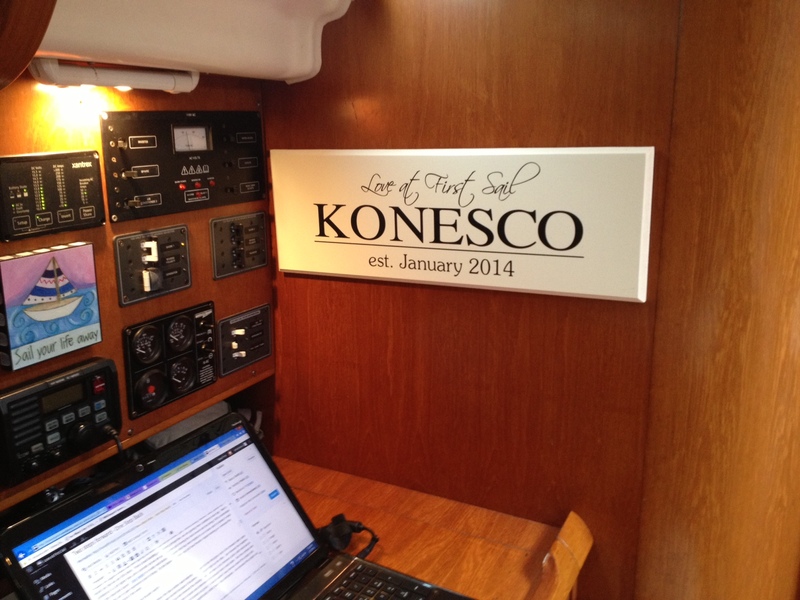 We now have 3 anchors on board for various weather patterns, currents and anchoring locations that we will face. We went with an 88 lb Delta and 200 feet of 3/8’s bbb chain. 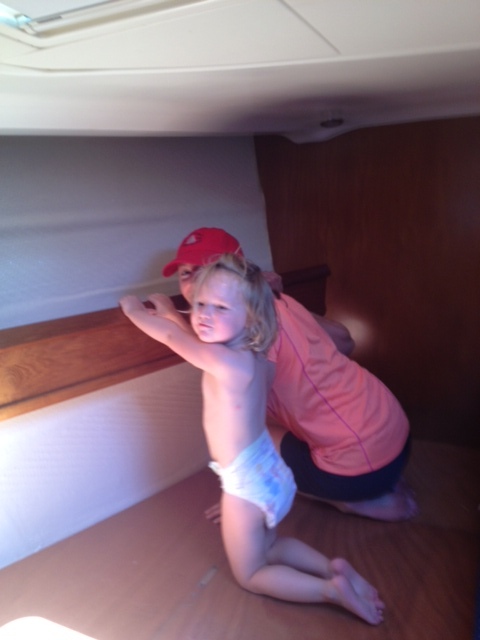 With these safety precautions in tact, we will now be spending more time on the ocean getting our “sea legs”. It feels good that we can start sailing more. 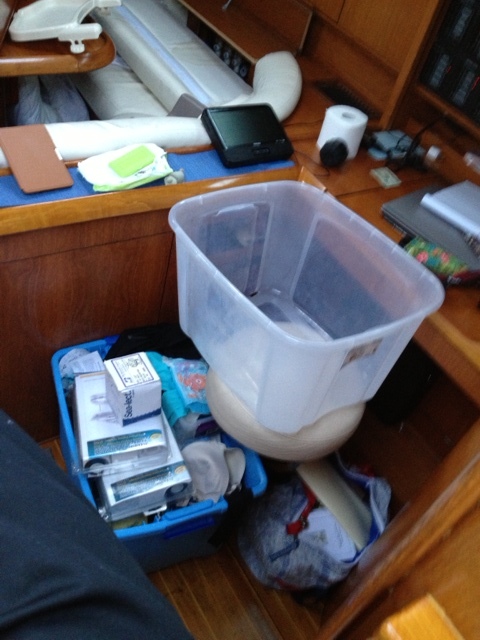 Probably the biggest forward has been figuring out where to put stuff (ie-clothes, pans, homeschooling material, charts, games etc). I would say that we are 95% there. 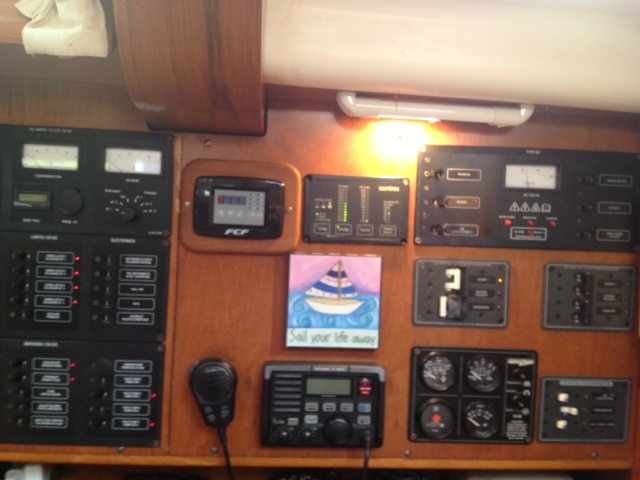 From a boat handling and docking perspective, we are gaining more confidence each day. Marc’s confidence is a bit higher than Jen’s currently but we are spending time just moving the boat around and becoming 100% comfortable with this important aspect. Boat master is a really neat docking simulator that has been helpful for us to learn and it’s similar to what airline pilots use to gain experience prior to flying. 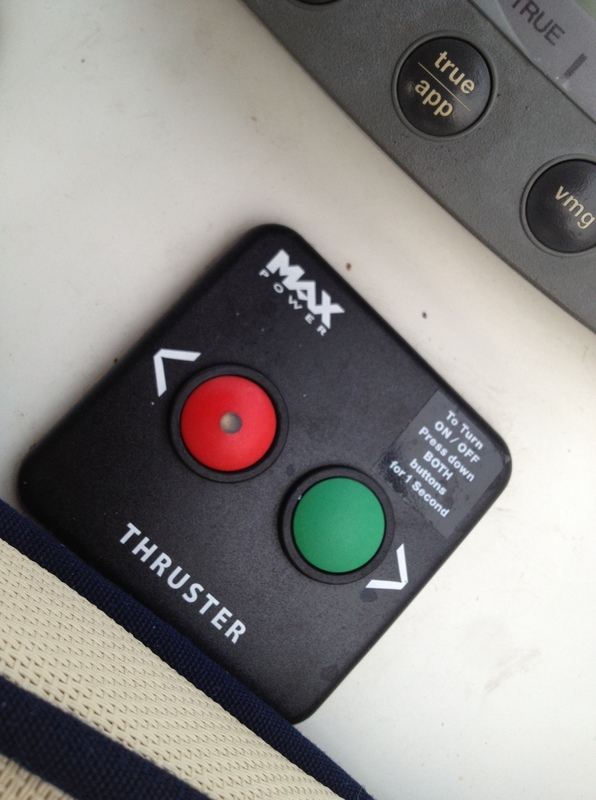 On the backwards front, our port bow thruster stoped working so I removed the switch and replaced it this week. 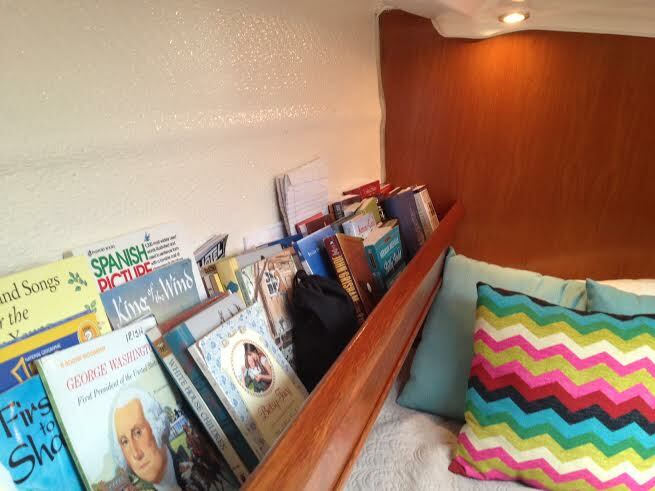 Also on the backwards front, our headliner (the faux leather wall material that is glued to the fiberglass hull) in the forward cabin came down due to time, heat and humidity. Jen was excited because it became a DIY project right up her alley. Jen removed the headliner and cleaned off all the foam and resin that held it up and removed the existing mold. 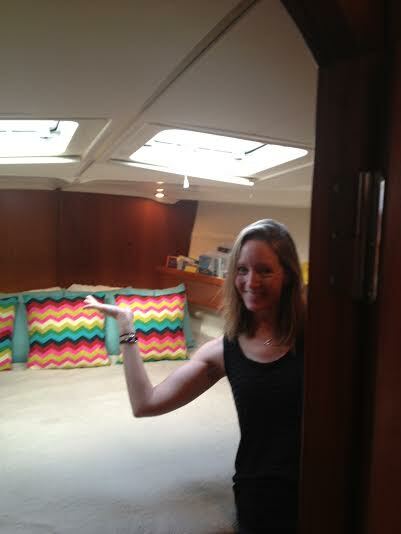 Jen has a zero tolerance policy with mold and as you can imagine there is always mold on a boat. But she is bound and determined to conquer every mold battle. 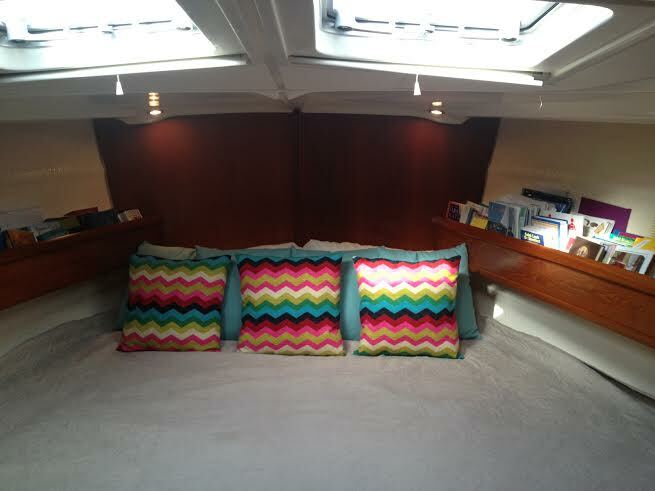 She then primed and painted the fiberglass interior hull wall with Interlux paint and it turned out great. I have to admit I was nervous about this project and our ability to get it done in a timely matter but the end result was significantly better than I had anticipated. 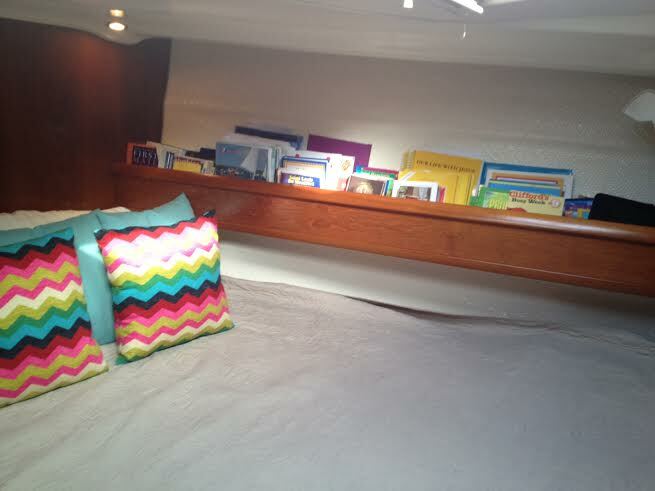 Jen knocked this project out of the park and makes the boat feel even more like home. Vinyl headliner removed before the deep clean. The black is mostly the old foam, not mold. 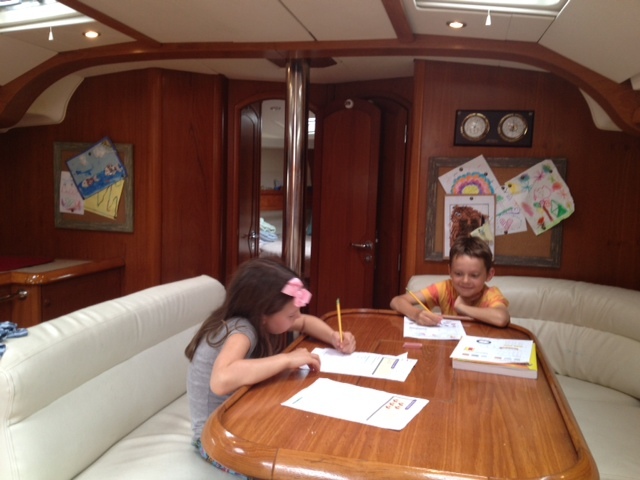 Homeschooling (aka boat schooling) continues to go well and Jen is a natural gifted teacher. I am really impressed by her. One of the neatest things for me is that the kids seem to want to talk about what they learned after boat school at lunch or dinner or just when we are hanging out. For example, we had a 45 minute conversation around the Cuban Missile crisis after they learned about it. For me, I am teaching religion and nautical/maritime. Both of these topics are near and dear to my heart and it’s fun teaching the kids knots, tacking and points of sail as well as teaching them about God. For nautical aspect of school, I am using the book that Jen and I used for our sail training and for the Church part, I am using the Faith and Life Series. Outside of the formal topics above, I probably have learned more the past couple of months then I have over the past 5 years. Some days, I think my brain is too full for anything else to go in. Either that’s a sign of me getting older or a sign that I am learning a ton. It kinda reminds me of my travels during college on Semester at Sea where I would go to bed exhausted but wake up so refreshed and eager to start the next day. I am also learning day by day that it’s the journey not the destination that is important. The journey will take us out of Fort Lauderdale some day but if it’s the next 2 weeks, 4 weeks or 6 weeks that is less important than the unfolding of how we are living together and learning the boat. So, our plan remains the same with us thinking that we will leave Fort Lauderdale late February or early March and head to the Bahamas. 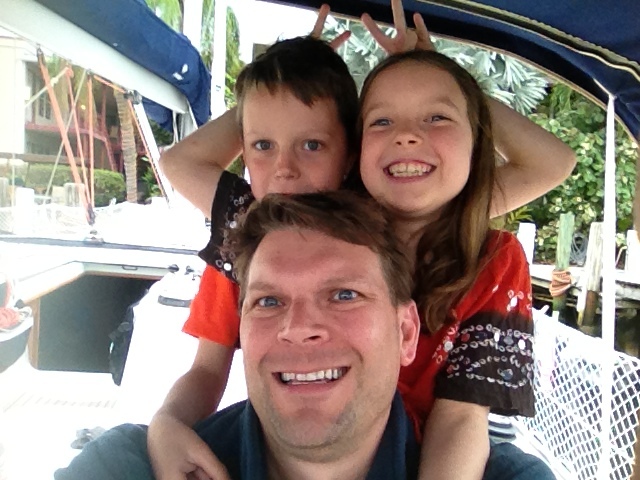 Prior to “officially” leaving the states then, we do plan to sail down to Miami and spend some time in Biscayne Bay on the hook (using the anchor), making sure we as a family feel confident with the boat and with cruising. The million dollar question is do we go north to the Abacos first or south to the Exumas first. Originally, we thought that we would go to the Abacos first and then head south but we are now leaning towards the Exumuas. More to come on that. who’s room is that what? Marc, don’t be one of those boats that leave us divers a nice Delta souvenir at the bottom….nice to find, but extra work…Keep posting your “warm” stories it helps keep our sub zero temps in Buffalo seem warmer…. What an amazing adventure you are having…………..May God be with you and your excursions and home schooling and all. You are in thought and prayer as we continue to deal with winter……………..Although, it is kind of pretty looking out on the snow flurries right now. Pray for our DJ retreat at Guerin (OLMC puts it on) next weekend, about 900 or so students will be attending. 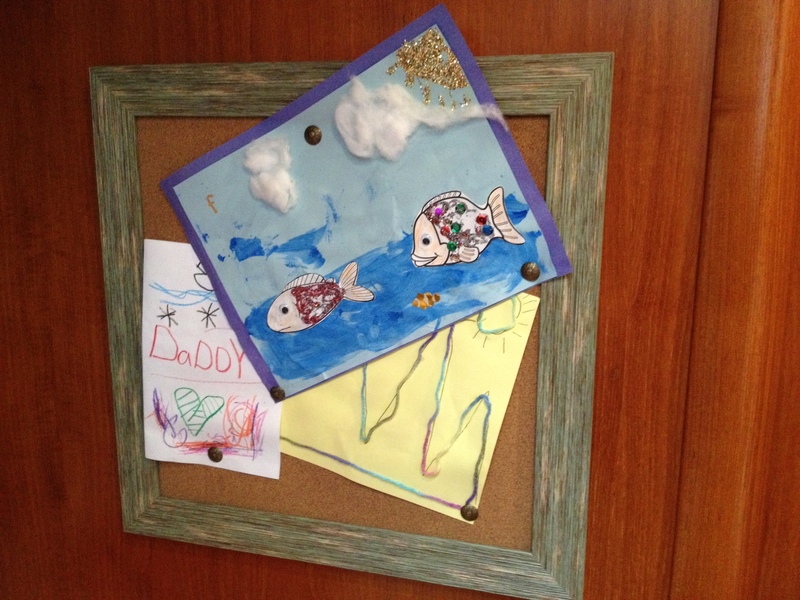 Leave it to Jen to tackle a DIY project and have it turn out AWESOME!!! Not surprised in the least Jen! YAAAAAAH BOAT, I love it! We love our 55 lb Delta and all chain rode… Bet you will find your bigger one contributes to sleeping soundly! The Exumas are less populated, drier, warmer and less affected by those US continental cold fronts than the Abacos. But we love th Abacos too! Have fun exploring for yourselves! Great post! The boat is coming along real nice.